There was magic in the air yesterday at Camp North Star, after 10 months of waiting we have a full camp once again. There’s almost nothing as exciting as seeing the smiles and hugs when North Star friends reunite. And, we were happy to welcome our new campers into the North Star family. Campers traveled from near and far to spend their summer with us with some campers traveling almost half way around the world from Thailand and Shanghai. Campers were greeted at the their cabins by their counselors who helped them unpack and introduced them to their cabinmates. It was a beautiful day under the pines so we wasted no time taking a dip in the lake to cool off and to take our swim tests. 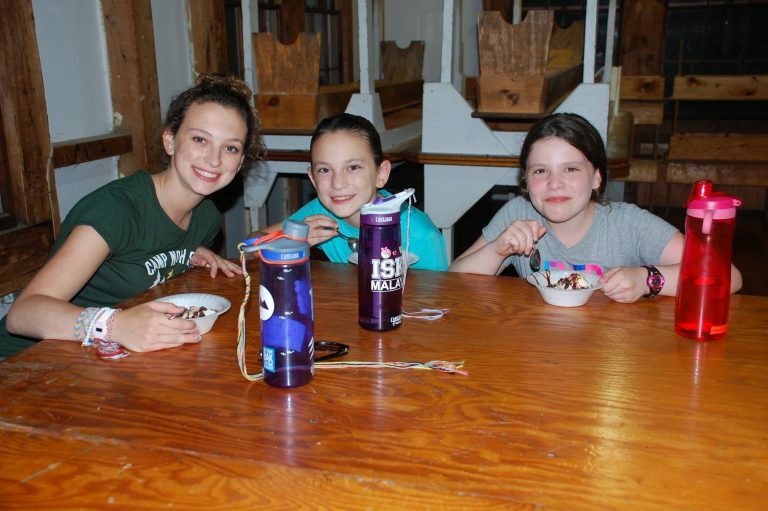 New campers learned camp traditions from singing camp songs to making friendship bracelets, but the real fun came after dinner. All our campers settled into camp with an evening of team building games and icebreakers with their cabins, each game led by our head counseors. We finished the evening off with a special treat, “Sundaes on Sunday”, our favorite new tradition here at CNS. Campers jumped right into their classes this morning including getting up on water skis, climbing the dangling duo at ropes course, making a clay creation at pottery, taking a fitness class and musical auditions for “Matlida”. It is fantastic to see the excitement from campers and counsellors alike, as they hurry from one class to the next with new friendships forming along the way. Tonight, campers are looking forward to competing in The Amazing Race. Each cabin will “travel” to 11 different countries where they will face different challenges along the way. If yesterday and today is any indication of how this summer is going to go, we are in for a real treat!